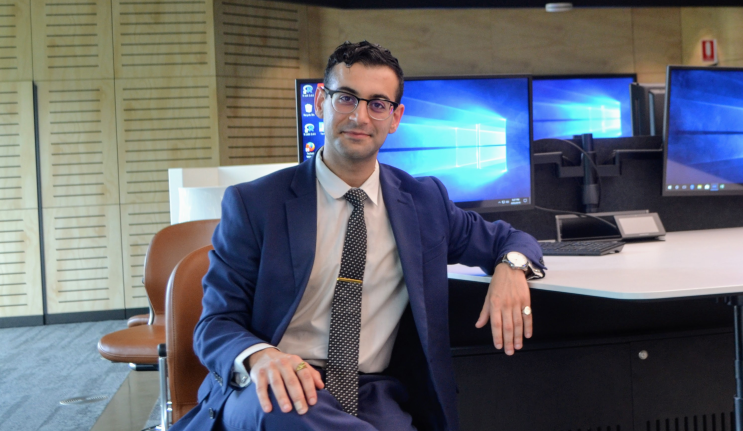 Alumnus Hamid Yahyaei is the Macquarie trifecta: alumnus, current student and staff. He’s now on a mission to promote financial literacy and the beauty of corporate bonds to help people understand that they can control their lives through their financial choices. In this in-depth Q&A, he shares his passion for finance, his views on the economy, and why being financially literate is so important. Hamid will be a guest facilitator at our Financial Literacy Challenge for the Backpack to Briefcase alumni event on Tuesday 2 July 2019. More details to come on our alumni events website. You could say that my life revolves around financial markets. I graduated with a Bachelor of Applied Finance in 2016 and was awarded both the FINSIA and Australian Finance Conference Prizes. I currently work as a credit research analyst at Spectrum Asset Management and I am also a guest lecturer at Macquarie University. I have commenced my Master of Research program this semester. Eventually, I would like to become a finance professor to pursue my passion in finance and teaching. Why did you pursue Finance? My first exposure to finance was through an excursion in primary school where one of my teachers pointed out we were in the financial heart of the city. It felt very energetic. Later on, as I became more in tune with the financial markets, I learnt about how central money is to our lives – the importance and the mystery of it go hand in hand. Money is always there in our faces and for many people, it is the sole purpose of their lives which isn’t a good way to go about it. It’s such a fundamental part of our lives, yet not a lot of people understand the workings of the monetary system. What does a credit research analyst do? As a credit research analyst, I help manage about $120 million worth of funds under management, and my job is to do the analysis and research on the investment opportunities. The idea is to better understand if we should buy a financial security or avoid it, and if we are to participate, is the price of the asset too expensive, cheap, or fair value. I spend a lot of time valuing companies and understanding their business, meeting with management to understand the risks, and how they fit into the broader economy. On any normal day I’m analysing the markets, on a teleconference, or on the road visiting companies to listen to presentations for their recent results. Being part of a small and growing business also means I have a lot of exposure to business building activities such as the marketing endeavour to promote our brand. My role has a good balance of the analytical number crunching and face-to-face relationship building. Tell us about your company, Spectrum Asset Management? Spectrum is an independent boutique funds management business that specialises in Australian credit. It has one of longest track records in the Australian credit space. In simple terms, Spectrum is focused on income. We look to generate returns that are higher than bank deposits, without the volatility of the equity market, whilst providing daily liquidity. I feel like if you talk to anybody on the street, they have a vague idea of what a share, stock or equity is. But when it comes to fixed income or bonds, there is a major lack of knowledge. And this is largely an Australia-wide phenomenon because when you compare our market to overseas markets, a larger proportion of investments are allocated to fixed income securities than here in Australia. For this reason alone, I believe financial literacy is important, because it allows regular mum and dad investors to think beyond the need to put all their money in the stock market when there are so many options within the investment universe. It is something that can be learned. Students also appreciate knowing the global debt market is filled with many career opportunities. Furthermore, the Royal Commission brought to light the inadequacy of financial literacy in the average Australian and how they were being taken advantage of. For example, they didn’t have the understanding or the skills to assess what their financial adviser was recommending, lacked the understanding around the fees or fee structures that are designed with particular products, and some of the bigger organisations were found to be offering their clients products that suited the commission driven agenda of the financial adviser. Financial literacy is imperative because if you can understand who the end manufacturer or manager of the product is, you can avoid conflicts of interest and better protect your financial health. So, it’s helping average investors think a little differently, be more aware of the breadth of investment products out there and to be more analytical and probing when it comes to the recommendations they might have been given. How are you raising awareness? My interest in financial literacy first started when I lectured at a local community college. I ran a very cheap, easy to understand, six-week course for students ranging from 18-year-olds just out of high school to 70-year-old retirees. Topics covered the basics of investing and helped explore the key differences in asset classes. It was a very rewarding experience as it showed that someone who has no experience and no background in finance can appreciate and understand these concepts – if they are taught in the right way. The interconnection between financial literacy and the way its taught is the most important aspect. If it’s too full on with too much financial jargon, people can’t enjoy the beauty of the financial world. The focus was on comfort, moving together from knowing nothing to something much more. Alongside this was my experience at Macquarie University. I have been honoured and have the privilege of teaching in the Master of Banking and Finance programme, in particular the capstone unit ‘Current Issues in Banking and Finance’ (AFIN899). 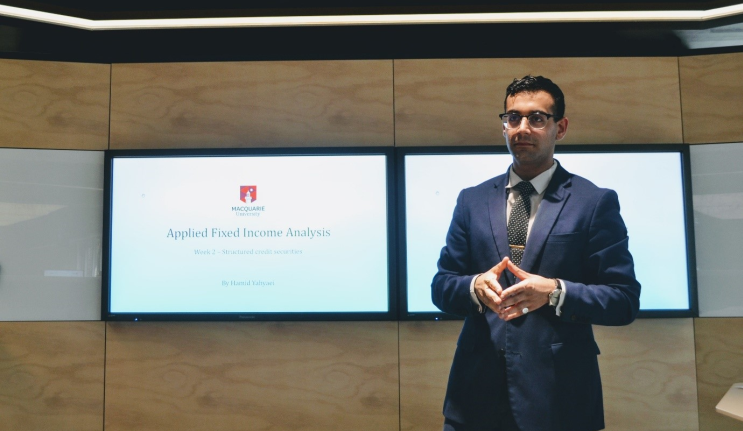 The unit convenor Dr Lurion De Mello, Program Director, Bachelor of Applied Finance, has done a great job in bringing industry practitioners like myself and getting them to teach different aspects of finance from the industry to students. I teach a block session across three different lectures focused on applied fixed income analysis. The students are exposed to hands-on analysis, modelling and professional platforms, like the Thomson Reuters Eikon platform, and are taught how a professional investor would think and analyse a bond portfolio. We do a lot of these classes in Macquarie University’s Finance Decision Lab – a state-of-the-art, multi-purpose lab which can receive real-time data and encapsulates a financial atmosphere with sophisticated computers, running the platforms and models. It’s so important to teach the students to get into the right mindset – to not disconnect the theory and groundwork from university to the real world. Dr Abhay Singh, Director, Finance Decision Lab (FDL), has been extremely helpful in teaching me to make full use of the Finance Decision Lab. What are your views on the current climate of financial markets? The current investment climate overall is difficult one because we are in “unchartered waters”. You could say that what we have seen is the greatest financial experiment after the Global Financial Crisis (GFC). This experiment was the idea of ultra-loose, unconventional monetary policy. Following the GFC, there was a need to get the global economy to grow again, so the idea from the major central banks was to cut interest rates so low to spur growth – this in effect would encourage corporates to borrow. In some economies interest rates were negative – which boggles the mind. They were able to artificially suppress interest rates at extremely low levels through a mechanism called quantitative easing, which is essentially a large scale process of liquidity injections into the market via the purchasing of government and corporate bonds, as well as, residential mortgage backed securities. Now several years on, we are seeing the repercussions of so much ‘cheap’ money coming into the system. Six months ago, talk was about how strong global growth was and how it was almost the end of this unconventional monetary policy. But today, global growth has been revised and the outlook is far more negative than it was, and there is talk of bringing this stimulus back into usage, perhaps even as a permanent part of central bank policy. It seems like our reliance upon this extraordinary stimulus is now entrenched. Coupled with elevated geopolitical risks, the outlook is uncertain. The reason I say it’s the biggest experiment is because it has distorted financial markets by bringing a lot of money into the system and has pushed asset valuations higher. The chase of yield has driven down interest rates and buoyed equity markets. It seems like the response from the central bank was to throw more money at the problem, which caused more borrowing and leverage. I feel like we haven’t learnt our lesson, as high levels of leverage was one of the main contributors to the GFC’s prolonged impact. Greed combined with a lot of easy money has put us in a weird situation where there is still not much growth, yet we are sitting on the most amount of debt we’ve ever known in humankind. How long can we continue to kick the can down the road before it bursts open? Domestically, there are two things happening of importance. On the positive, higher iron prices have helped our exports and have supported the A$. Civil infrastructure projects have kept a lid on unemployment, so our economy looks reasonable from this standpoint. But the other, more important view, is on the housing market and the potential repercussions of continued price depreciation. House prices have been falling consistently since their peak. Whether this continues or not is the big question, and should the market collapse, it could get ugly. Foreign investment into our housing market is decreasing and the availability of credit has diminished – two forces which may continue to put downward pressure upon housing prices if they continue to worsen. Where the market goes to from here is anyone’s guess, but the risks are definitely skewed to the downside. What are your goals for the future? Career and personal? I think I am one of the very lucky people to have found my area of passion. The first goal is to continually be the best credit research analyst I can be, and to constantly learn and adapt to new developments in the financial markets. This role is constantly evolving so to succeed is not to reach a single point, but to constantly manage the changing landscape. The second is my passion for lecturing. As I slowly work towards my Master of Research, and one day to a PhD, when I decide to leave the financial markets, I would love to be a lecturer and pursue the professorial route. Research is absolutely fascinating, and it is very rewarding teaching students. Why are you so drawn to Macquarie? I’ve had quite a difficult childhood and upbringing and high school wasn’t the easiest academic experience. But coming into university, Macquarie provided a community and environment that allowed me to fly and to realise my full potential – both academically and socially. I have a lot of gratitude towards Macquarie University as a community and a lot of gratitude for the academics who pushed me further to be a better student, and all the various programs such as the First Step Mentoring program within the Faculty of Business and Economics. They have brought me out of my shell and made me the person I am today – someone who takes advantage of opportunities, who appreciates collaboration, and lifting other people up. The Department of Applied Finance is also one of the key reasons I have decided to continue my studies at Macquarie. The department is in my opinion the best in Australia – and this is easily justified when you look at the breadth of experience both from an industry and academic point of view. Who has been the biggest inspiration for you in your career? This has to be my mentor, role model and my boss, Damien Wood, Principal, Spectrum Asset Management. Prior to Spectrum, he was the Head of Credit Research for Credit Suisse for the Asia-Pacific region and is definitely in my opinion one of the best in the world when it comes to credit research. He is pushing me quite hard to change my way of thinking and to view things beyond the first or second order effects. He has been the biggest career inspiration for me and having this role model has been invaluable because at my age I’ve been exposed to many different opportunities and many aspects of business. In addition, I have also been given autonomy in my role to pursue my own projects and further studies. What’s one final piece of advice you would like to give? On a daily basis, its so important to remind yourself that every aspect of life is about CHOICE. In any difficult period, you have a choice to experience the situations as detrimental or as a foundation for a learning opportunity. This choice is both liberating and powerful. In my life, I am just a person going about his journey, and I am not an expert or a genius or a guru by any standard, but just trying to make the best decisions I can and reminding myself that I have a choice in responding to hard times or stress. This is the differentiating factor between someone who loves their life and somebody who doesn’t fully take advantage of it. Hello Hamid, it is great that you have found your area of passion. To assist others by teaching must be very rewarding.